Harrison studied at the Carlisle College of Art from 1957 to 1961; the Royal Academy Schools, London, England, from 1961 to 1964; and graduated from the Perugia Fine Arts Academy, Italy, in 1965. She was one of founders of the London Women’s Liberation Art Group in 1970. A 1971 exhibition of her work that was closed by the police included a piece depicting Hugh Hefner as a Bunny Girl. Between 1973 and 1975 she collaborated with artists Kay Hunt and Mary Kelly to conduct a study of women’s work in a metal box factory in Bermondsey, London. They presented their findings in 1975 in the installation Women and Work: A Document on the Division of Labour in Industry 1973-1975 that was first displayed at the South London Art Gallery in 1975. The exhibition told the stories of 150 working women who participated in the project and offers an account of the participants’ relationship to the workplace, as well as reflections on the changes in labour and industry brought about by the Equal Pay Act (EPA), which had been passed in 1970. Her work was included in the exhibition ‘’Issue: Social Strategies by Women Artists’’, curated by Lucy R. Lippard, at the Institute of Contemporary Arts, London in 1980. This important international group exhibition highlighted socially oriented feminist art practice and has been recognized as a key feminist exhibition. 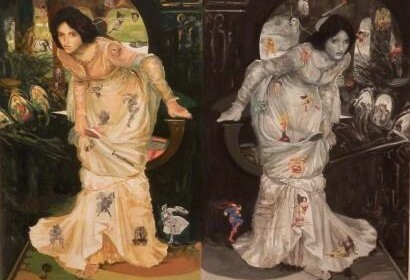 According to Chris Crickmay, Harrison’s work was amongst others coming into prominence “reflecting social concerns that had not hitherto appeared in art galleries”. In 2011 she exhibited works on paper in the show “I am a Fantasy”, curated by Beverley Knowles at the Payne Shurvell Gallery in East London. Her show ‘On Reflection’ was at the same Gallery in 2013. She had a one person show at Silberkuppe Gallery Berlin in 2012. In 2013, she won the Northern Art Prize for her installation ‘Reflect’ which consisted of 3 interconnected works ‘The Last Gaze’ , ‘ Objectiflection’ & Common Reflections. In the same year she received one of the prestigious Paul Hamlyn Awards for Artists. Copyright © 2019 Margaret Harrison. All Rights Reserved.